The Fruitvale restaurant captures the underrated expansiveness of Cambodian cuisine. 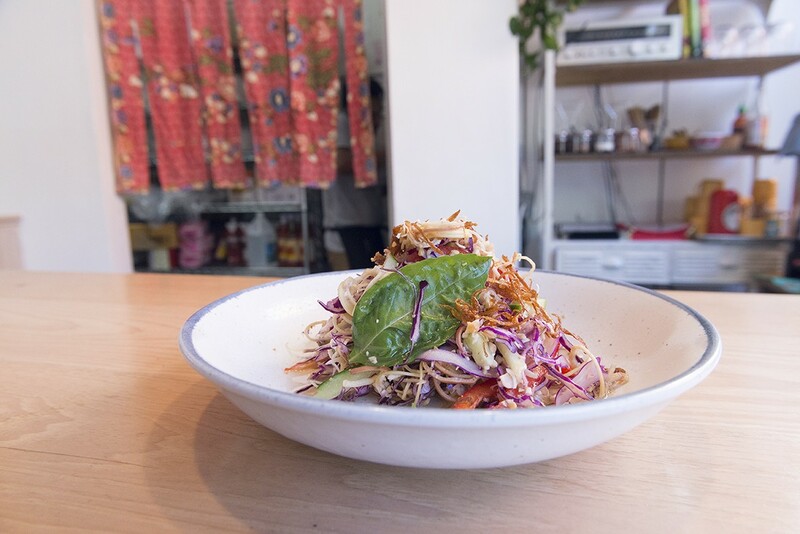 The banana blossom salad is crunchy, tangy, and refreshing. This month, Cambodia will make international headlines for its probable sham of a national election. Hun Sen, the world's longest-serving prime minister, is expected to win another five years in office. Never mind that his administration arrested members of the opposing political party and shut down critical media outlets in the last several months. It's a frustrating time for Cambodia's younger generation in pursuit of change — not only a change in leadership, but a change in the way the world perceives Cambodia. Despite its failing democracy, the country's rapid development and booming culture places it a far cry away from the Cambodia of the 1980s, devastated from war and a genocide that wiped out a quarter of its population. But here in the U.S., many still tend to think of Cambodia as that war-torn country and little else. 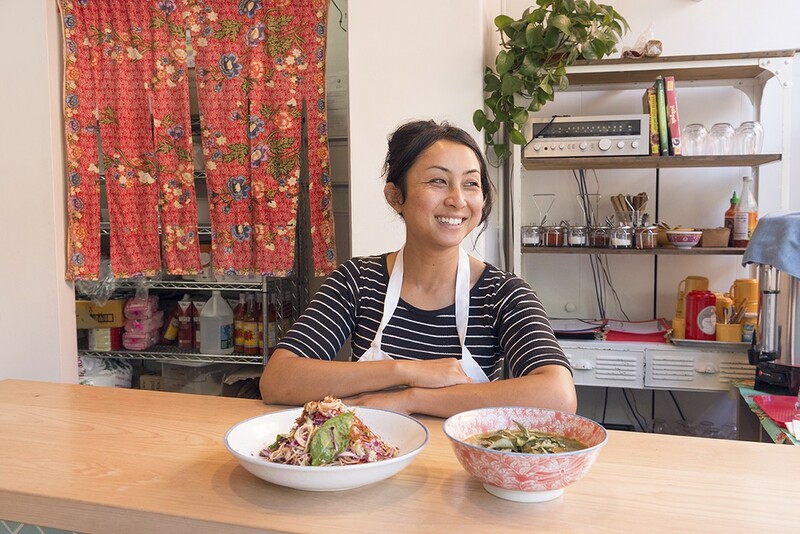 That's part of Nite Yun's motivation in opening Nyum Bai, her Fruitvale restaurant that started as a San Francisco pop-up and then a temporary kiosk in Emeryville's Public Market. She wants to expose people to the wonders of Cambodian cooking — the aromatic, powerful stuff she grew up eating in her mom's Stockton kitchen. And she wants to introduce Cambodian culture — namely the lively, surfy rock scene of the '60s — to a wider audience. In general, Cambodian restaurants in the Bay Area haven't presented a convincing argument for why Cambodian food ought to rank up there with fellow, far more popular Southeast Asian cuisines. Few exist, and those that do typically offer huge menus with traditional Cambodian dishes buried under an onslaught of Thai basics and generic stir-fries. That's what makes Nyum Bai a game-changer — not just in Oakland, but on a national level. Nyum Bai is the sort of restaurant that could really only be created by someone like Yun, who was born in a Thai refugee camp to parents fleeing mass killings in Cambodia and came to California at age 2. Eight years ago, she visited Cambodia for the first time and realized she needed to bring that culture back to the Bay Area. With the help of local food business incubator La Cocina and a successful Kickstarter campaign, she opened Nyum Bai's doors in February. The retro-modern space looks adorably inviting, with pops of pastel pink and baby blue. Cambodian rock plays nonstop, and nearly destroyed album covers decorate one of the walls. But the area that feels the most Cambodian is actually outside, in the open-air, teal garage where incense burns. It's a great spot to order the machoo kroeung soup, the single dish that made me utter, "Oh my god, this is hella Cambodian." Pork spareribs float in a soup visibly full of kroeung, the spice paste consisting of lemongrass, shallots, galangal, kaffir lime leaves, and fresh turmeric that makes Cambodian food taste Cambodian. The broth braced in its herbaceous quality, with crunchy water spinach and meaty pork that fell off the bone. Yun makes huge batches of kroeung once or twice a week, though she said the prepping feels constant. The flavor of kaffir lime seemed especially powerful in the chicken curry, velvety and thick from coconut cream. While the portion of sauce is generous — and gorgeous spooned over rice — I hoped for a little bit more chicken. Still, the meat that was there was dark and juicy. The kuri saramann also impressed, although Yun has since taken it off the daily menu. (She plans to bring it back when the weather cools down, and as an occasional special in the meantime.) It was a hearty, creamy curry with soft, braised short ribs flavored intensely with warm spices like cardamom — evidence of Cambodia's Muslim population and a great introduction to the expansiveness of Cambodian cuisine. The final curry on offer is Nyum Bai's best: amok, Cambodia's national dish. Catfish gets steamed with kroeung-based coconut curry and egg to form a custardy, fish soufflé. Nite Yun first started Nyum Bai as a pop-up. But Yun does far more than curries well. Her kuy teav Phnom Penh, a noodle soup starring a seven-hour pork broth, shrimp, and crispy garlic, is the first dish that launched her pop-up fan base, and she still makes it in Fruitvale. The kuy teav cha, skinny rice noodles stir-fried in dark soy sauce with a runny egg on top, carried the smoky flavor from the wok. The ginger fried chicken, with sticky and shatteringly crispy skin, was flawlessly executed. The simple side of stir-fried water spinach with pungent, salted beans demonstrated the power of restraint. The shredded banana blossom salad with mint, basil, bell peppers, and peanuts refreshed with its bright tanginess. And the sach ko aung made the case for how a nation's dishes can sometimes be prepared better elsewhere. While the grilled, kroeung-marinated beef skewers are tasty in Cambodia, the quality of meat is far higher in California, and it showed in the perfectly charred, juicy beef. Many of these dishes carried a pleasant funk from prahok, Cambodia's fermented fish paste, which, along with kroeung, forms the flavor base for the cuisine. At Nyum Bai, it's most prevalent in the prahok ktiss, a coconut-pork dip that struck a nice balance between sweet and funky — and tasted even better with extra chili oil. The raw vegetables surrounding the dip looked attractive but didn't all make the most logical scoopers, such as green beans and asparagus. Yun unveiled a new lunch menu last month, making it easier for solo diners to come by for a quick lunch without the family-style nature of dinner. Some of these new lunch items — including some carryovers from the Emeryville days — still need tweaking. The non-traditional fried chicken sandwich felt proportionally off, with too much bread and overly bready chicken. And while I liked the cold, Kampot-style noodles in Emeryville, the Fruitvale version struck me as surprisingly one-note; I wanted more tang from the coconut-lime dressing and more fresh herbs. The grilled pork over rice was the standout lunch plate, starring sweet, succulent pork marinated in soy sauce, coconut milk, palm sugar, and garlic. It's served simply with rice, a fried egg, and arugula — to take it to the next level, I'd love to see it with pickles and a side of fish sauce. The curry noodles, with vermicelli dropped into a thinner version of the flavor-packed chicken curry, tasted polished as well.